Bio's project augmentation services help our clients to deliver their business and IT objectives. Our services give our clients breathing space to balance business and IT requirements with internal capacity. No longer do you need to defer important IT projects because there is too much to do – nor is it inevitable that projects have to slip or go over budget. Smaller projects can be just as important as larger ones, even if they don't demand full-time attention – they don't have to fall between the cracks! Bio Project Augmentation can be engaged at any stage, whether before, during, or even after a project, to ensure things are put on track and stay on track. From the smallest project, right through to full portfolio or programme control, our services scale and flex in accordance with the circumstances, with the core objective of driving efficient, timely and on-budget benefit realisation for our clients. Our client-ready, service-based approach, ensures that not only is Bio a natural extension to your team and ways of working, but also our granular, multi-disciplined approach ensures our clients get the right mix of service type at the right price point. 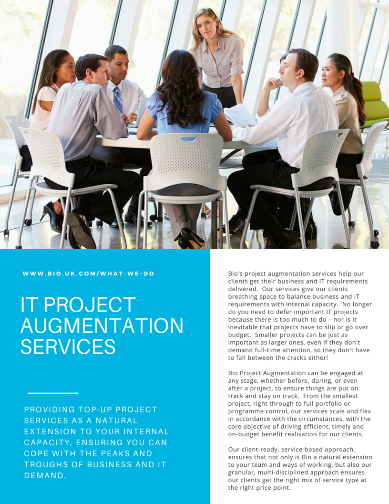 WHAT ARE IT PROJECT AUGMENTATION SERVICES? 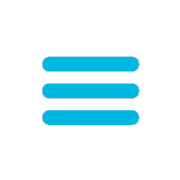 Fractional Services: a cloud or premise-based service, in which clients can use the service in fractions rather than full-time. Interim Services: a customer-dedicated service, in which Bio provides interim skills and resources to augment a client project or programme. Project Recovery Services: a step-in service, which helps clients bring problem projects or programmes on track. Project Management Office as a Service (PMOaaS): either onsite or cloud-based, a governance and control service that ensures the efficiency of our clients’ multiple projects. This can be combined with other services to create an effective top-up service model. WHEN DO YOU NEED IT PROJECT AUGMENTATION SERVICES? WHAT ARE THE BENEFITS OF IT PROJECT AUGMENTATION?